Empathy has a mixed reputation in business, often valued by HR and the Emotional Intelligence fans many leaders are somewhat uneasy about it. Leaders often equate it as one of the dreaded ‘soft’ skills. In his book Give and Take Adam Grant tells the story of two business men who built a successful company. After some time one starts to give less energy and focus to the business whilst still taking a salary and other perks from the company. His business partner, Peter felt unable to challenge this behaviour even though he felt it was wrong. Part of the issue was the close bond the two men had built whilst creating the company. In effect Peter was a victim of his own empathy. Only after stepping back and taking a more intellectual view was Peter able to see that his partner preferred starting a business to running it. You can read more about Grant’s book in my blog How to be a success at work. Empathy has a mixed reputation in business, often valued by HR and the Emotional Intelligence fans many leaders are somewhat uneasy about it. Leaders often equate it as one of the dreaded ‘soft’ skills. You can get a different perspective on empathy in this RSA video The Power of Outrospection. Science is showing us that empathy is far from ‘soft.’ Empathy keeps relationships on track. Studies by Antonio Damasio in his book: “Descartes’ Error: Emotion, Reason, and the Human Brain” showed that people with damage to the brain in areas associated with empathy had difficulties is forming and maintaining relationship, even though their reasoning and learning abilities remained. Deep empathy for another’s distress means a leader is more likely to withdraw from the situation rather than be motivated to help. Empathy is an important way of understanding what people are thinking and feeling. It is usually defined as the emotional understanding of another. Neuroscience studies show that both bottom-up automatic limbic areas are involved as well as top-down controlled processes in the cortical brain. These areas interact to produce the experience of empathy. Knowledge about the context in which the pain, mental or physical, occurs provides important clues to the role of top-down cognitive appraisal in the regulation of empathy. A leaders who ‘gets lost’ in the pain of another will be unable to help them. Much like Peter was unable to solve the issue with his business partner whilst he was deeply empathic. Deep empathy for another’s distress means a leader is more likely to withdraw from the situation rather than be motivated to help. 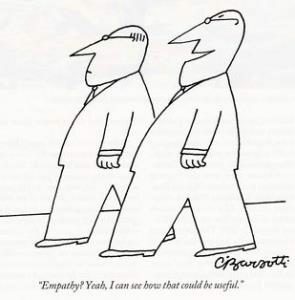 In some situations leaders may benefit from being empathetic about either outcomes, the project failed for unusual reasons, or intension, the person wanted to achieve the right outcome by didn’t. Interaction with others hones these skills in a way that sitting in the corner office will not. Perspective taking is the intellectual or cognitive understanding of another. Other studies have found that empathy may be less helpful in some business situations. For example Adam Galinsky found that in negations those who were empathetic ended up with worse deals than those who were more detached; that is able to take a perspective. Perspective taking is the intellectual or cognitive understanding of another. In Galinsky’s study being able to take a rational perspective of what the other person may be experiencing resulted in an increased ability to discover hidden agreements and to use them to make a better deal. In a different study on service quality it was found that customers ratings of satisfaction were lower when they were offered empathy and assurances compared to when they were offered responsiveness and reliability. Different organisational cultures will be more attuned to either empathy or perspective taking. Neuroscience studies show that empathy is activated before perspective taking which is associated with activation of the inferior partietal cortex, the medial posterior cortex and prefrontal cortex. This suggests that different perspectives activate different brain regions. The ability to reason about another’s mind as opposed to feeling what they are feeling shows a shift from frontal to posterior brain regions and from bilateral to unilateral left inferior partietal. Different organisational cultures will be more attuned to either empathy or perspective taking. The important question for leaders is which is more appropriate in any given situation. Having empathy when firing someone for gross misconduct may not serve you well whereas being able understand another’s feelings on a proposal when influencing them may. Also being overly empathetic for example when a team member is stuck in dealing with a difficult customer may keep you stuck also whereas perspective taking may enable you to see alternative ways to improve the customer relationship. 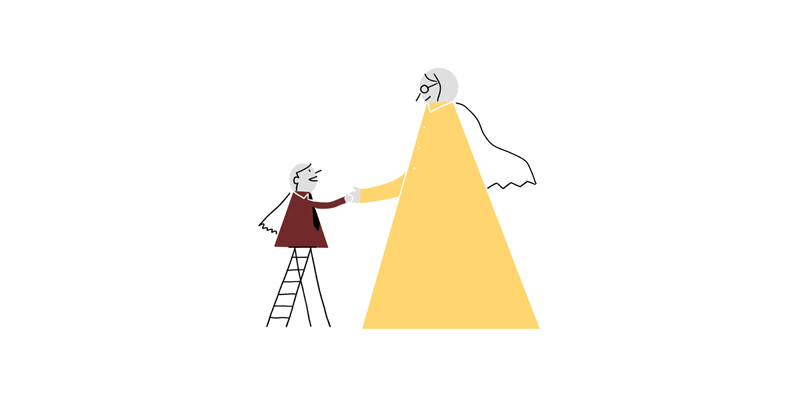 Perspective taking can help when planning for difficult conversations or when it is essential to influence another, helping you to understand why they feel as they do rather than what they are feeling.